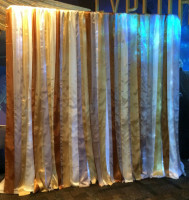 Enhance any area for your special occasion with customized Pipe and Drape Backdrops! Let Love & Joy Events create a customized backdrop for your special event. 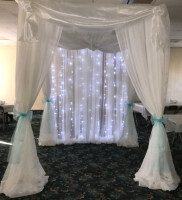 Lighted alters, columns, pipe and draping, archways, and more! Perfect for any wedding, reception, party, or photo session. Pipe and drape also can be used for room dividers for large spaces. Call us for a free consult to help you design your space!